In November of 1963, Phil Spector was the Top Dog, the King of the music business...or so he thought. The Hollywood-based record producer had released 12 singles on his Philles label in the previous 12 months, and every one had reached the national charts; all but three made the top 40, five went top ten and he'd kicked off the impressive run with a number one smash. What he didn't yet know was that he would never have another year anywhere near as successful. Unlike some of his competitors who were gaining longer-term momentum (such as Berry Gordy of Detroit's Motown Records or crosstown L.A. rival Snuff Garrett at Liberty), Spector would soon (but not too soon) be sliding into a downward spiral (strangely enough, he would find the law waiting for him when he bottomed out about four decades later). Had he been less self-absorbed, he might have taken the commercial failure of the album he'd just finished, A Christmas Gift For You, which he considered a masterpiece, as a sign of things to come. Except he was right...it was an exceptional work, critically and in terms of durability in the often fickle realm of pop culture. There was something distinctive about Spector's one-hit-per-month streak of '62 and '63 that would have been easy for radio listeners to overlook. Eight of those recordings featured Darlene Love, a singer with an unusually strong vocal quality. 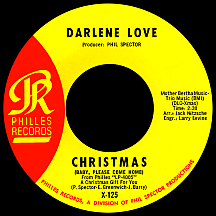 The singles went out under three different names; Darlene was used as lead on most while having a secondary role on one or two, so her vocal contributions went over the heads of all but those with the most discerning ears. But that's how it was for much of her six decades as a professional singer; alternating between group member, solo act and background singer went hand-in-hand with sleeping, eating and breathing. Fanita James (birth name Barrett) managed to remain well-grounded in a business brimming with out-of-control egos. 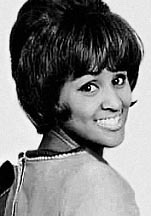 She formed The Dreamers while attending John C. Fremont High in L.A., circa 1954, with Gloria Jones and twin sisters Annette and Nanette Williams, all of them born in 1938. They were talented enough to get in the door at Modern Records, backing Richard Berry on "Bye Bye" in '54 and "Daddy Daddy" the following year, before doing one record of their own in '56 on the company's Flip label, "Since You've Been Gone," a terrific rendition of a song Berry had written. Later they opened some local shows for Capitol artist Johnny Otis, getting signed to the same label in 1957 through the efforts of their manager, Eddie Beal. Executives at the label decided to changed the quartet's name to The Blossoms. Three Capitol singles under Beal's direction ("Move On," "Little Louie" and "Baby Daddy-O") were more pop-oriented and gimmicky than the Flair and Flip sides. The Williams sisters decided to quit after Capitol cut the group loose, but the Blossoms were far from finished. As good a vocalist as Fanita was, after hearing Darlene Wright singing at a wedding, she knew she'd found an ideal lead for her group. She convinced Darlene (who was also born in 1938) to join, singularly replacing the twins, the resulting vocal trio stronger than before. It took some effort, but they began doing occasional studio work and notched a minor chart entry on Challenge Records in the spring of '61, "Son-In-Law" (an answer to "Mother-In-Law," the smash hit by New Orleans' Ernie K-Doe). Darlene's vocals came through loud and clear on follow-ups "Write Me a Letter" and "The Search is Over," but neither gained any traction; increasing demand for the girls as session singers became their the main source of income. Of many such assignments, their biggest hit came as the vocalists on Duane Eddy's "(Dance With The) Guitar Man," which credited them as The Rebelettes, a hit in the fall of 1962...just as the trio's position on the music scene was about to take a bizarre, but welcome, turn. In what could have been another backing assignment, the Blossoms were hired by Phil Spector and his partner, Lester Sill, for a session at the Gold Star Studio with a sense of urgency: Snuff Garrett was going to record a great Gene Pitney song with Vikki Carr and Phil had to beat him to the punch! His star act, The Crystals, weren't immediately available, so the Blossoms and Bobby Sheen, a singer Phil had worked with before, served as replacements. Darlene nailed the angst contained in the lyrics ('...just because he doesn't do what...everybody else does...), they were all paid a one-time studio fee, and "He's a Rebel" was rush-released...as a Crystals record. In November it hit number one (while Vikki's version on Liberty tanked). Darlene Wright wasn't wild about Spector's marketing deception. He, on the other hand, loved her dynamic vocal sound and called her back, along with Fanita and Bobby Sheen, for a warped new idea he'd come up with: a remake of the 15-year-old "Zip-A-Dee Doo-Dah" from Walt Disney's Song of the South. The feverishly unique recording was credited to Bob B. Soxx and the Blue Jeans, the name itself perhaps dated by several years...and it caught on, going top ten at the end of December '62. Romantic teenage dilemmas by songwriting teams like Barry Mann and Cynthia Weil or Ellie Greenwich and Tony Powers became high priority from that point on; "He's Sure the Boy I Love" ended up as a Crystals record, "Why Do Lovers Break Each Other's Heart?" became the Soxx/Jeans follow-up, then - surprise! - "(Today I Met) The Boy I'm Gonna Marry" was released under a moniker devised by Spector for his hot vocalist. Wright liked the sound of her new stage name: Darlene Love! After one final Bob B. Soxx single (the tongue-in-cheek "mother-vetoes-engagement" protest "Not Too Young to Get Married"), it appeared the newly-christened Love would be rising to the level of solo stardom she'd deserved with "He's a Rebel" (I mentioned Fanita's ego was in check; such was not necessarily the case with Darlene! ); the sprightly "Wait 'Til My Bobby Gets Home" was her biggest solo hit. Mid-chart effort "A Fine, Fine Boy" (a retread of "He's Sure the Boy I Love," it exposed the Crystals and Love songs as being by the same artist) came in the fall, just ahead of the planned grand finale for Phil's hit-filled year. The cover of A Christmas Gift For You placed Darlene in a subtle Newport-cigarettes-ad-style position of dominance, above the album's other stars (the Crystals, Ronettes and an incorrectly-configured Bob B. Soxx and the Blue Jeans) with her name fanned out above her outstretched arms. Considering how things developed in the coming months, it was a false impression. The longplay release happened to coincide with the assassination of President John F. Kennedy; whether or not that was a detriment to its success is open to debate. Sales at the time were less than stellar, but as far as any lasting contribution it has made to the rock music of the holidays...well, there's just nothing that tops it. Spector's "Wall of Sound" arrangements, achieved with input from long-suffering accomplices Jack Nitzsche and engineer Larry Levine with a score or more of L.A.'s best session musicians, revitalized the selections made up mostly of holiday standards from recent decades. Three songs made famous by Gene Autry between 1947 and '50 ("Here Comes Santa Claus," "Rudloph the Red-Nosed Reindeer" and "Frosty the Snowman") were evenly split between Soxx, Crystals and the Ronettes, "Santa Claus is Coming to Town" got the Crystals treatment and the Ronettes took on Leroy Anderson's "Sleigh Ride" and Jimmy Boyd's hit "I Saw Mommy Kissing Santa Claus." All great. Darlene's four selections included "Winter Wonderland" and the biggest of all, Irving Berlin's blockbuster-by-way-of-Bing Crosby, "White Christmas." Then there was the album's only original song, Ellie Greenwich and Jeff Barry's non-seasonal tune "Baby Please Come Home." Spector suggested it be given a yuletide setting and lyrics were adjusted accordingly (he added his name to the publishing, a dubious "bonus" he gave himself from time to time); "Christmas (Baby, Please Come Home)" was released on Philles in 1963 and again a year later with a different catalog number (there were three flip sides, not all of them seasonal). But it didn't catch on with radio programmers...what did they know, anyway? It's doubtful Darlene imagined this one song more than any other was going to keep her career rolling along for another half century or so. Like he'd done with others, Spector's shoulder towards Darlene Love turned colder over the course of the next year. The Blossoms made a record for Reprise as The Wildcats, "What Are We Gonna Do in '64?," written by Lee Hazlewood and produced by Nitzsche, a dance-trend-query that could have been misconstrued as a "What's Phil going to do with us?" concern. As it turned out, he was losing interest in his Ms. Love anyway. Her final Philles single, "Stumble and Fall," mirrored its title in the marketplace. Darlene, Fanita and new Blossoms member Jean King were hired as regular singers on ABC-TV's Shindig!, a gig that provided steady pay and gave them weekly exposure from September 1964 through January '66. Moving forward, the group recorded for Reprise as The Blossoms and had two minor chart entries, "That's When the Tears Start" and "Good, Good Lovin'," and Darlene waxed one solo single ("Too Late to Say You're Sorry"). They kept going well into he 1970s with singles on the Ode, MGM, Bell, Lion and Epic labels, all the while doing frequent session work supporting a who's-who of popular artists. Darlene took a break in the 1980s before being cast in Leader of the Pack, a Broadway musical celebrating Ellie Greenwich and the hit songs she composed with ex-husband Jeff Barry and others. Darlene performed a new seasonal song, "All Alone on Christmas," in the 1992 film Home Alone 2: Lost in New York. But it was David Letterman (and his longtime musical director Paul Shaffer) who recognized the brilliance of Greenwich and Barry's "Christmas (Baby, Please Come Home)" as definitively belted out by the great Darlene Love. She performed the song as a yearly holiday tradition on Letterman's late night NBC and CBS shows from 1986 until his retirement 29 years later.